This was an amazing experience of some quality Utah skiing. I spent two days at Solitude and then one at Alta. All three days were wall to wall, open to close, powder-fests. I had originally planned on skiing a fourth day here in Utah but my body is feeling the effects of that much powder skiing so I have decided a rest day was in order. That meant at least I would have a chance to catch up here as well as pack some things before I head out tomorrow to Wyoming. My friend is flying into SLC airport around noon and then we get on the road to our Airbnb in Alpine, WY. This is about an hour from the mountain, but at least the drive is scenic and it was far cheaper than staying anywhere in Jackson proper. Even with the gas cost difference, I will come out way way ahead. Plus I like a little bit of peace and quiet while on a ski trip and so being out of town is not a bad thing. Anyways, I loved the terrain and even more so loved the snow here in Utah. I had been here last year but as a “bad snow season” I guess I did miss out quite a bit. These three days were the best skiing of my entire life, with each day better than the last. I had no idea where I was going on the mountain but oh man did it not matter. It was a 2+ foot powder day and much of the mountain hadn’t been open the day prior during the storm. So there was plenty of fresh tracks everywhere. A lot of the easily accessible stuff had at least a few tracks but any of my woods explorations led to gnarly terrain with untracked pow. It was a wonderful day of exploration, with Honeycomb canyon being the true highlight. But really everything on the mountain was amazing. The following day I figured there would not be much powder left to discover but oh man was I wrong. Sure most of the sections I had skiied the day prior were now the same as comparing “fresh bread out of the oven” to “day old fresh bread”. But there were some new sections that opened as well as a simply untouched area that I hadnt explored the day prior. The first being Highway to Heaven which was an untracked bowl at the back of the Summit lift. Required going through an untracked traverse and a hike back up at the end. But ooooooh was it worth it. That run alone made it a better day than the previous. Then I checked out the Sunshine lift, a fixed grip slow triple away from everything else and found even more goods. I guess that lift is just ignored for its slowness and relatively low angle terrain. But as soon as I went through the gate at the top, it was untracked through the woods all the way down! I repeated this at least a dozen times and was absolutely dying by 2pm. 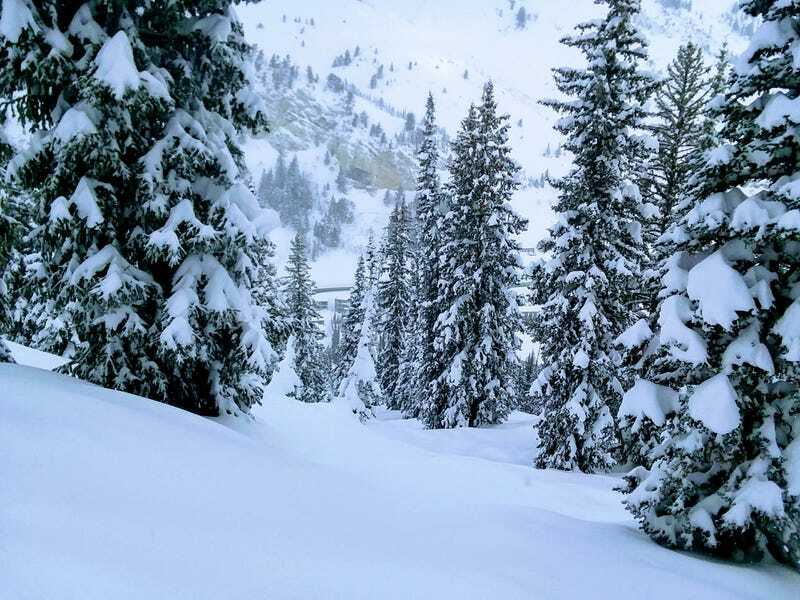 Since it snowed another foot or so on Wednesday night, I figured I couldnt go wrong with a trip to Alta. OOOOOOOOh yes was I right. It was even better than the last two days, simply due to the first run. This was the highlight of my skiing history and will live in the halls of skiing infamy, likely forever in my mind. I made about the 8th chair on the slow double, Wildcat. When I got to the top, most of the others just immediately went for the runs under the lift that empty out into flat crap. I didnt feel like dealing with that and I wanted truly first tracks. So I followed the completely untracked traverse along the ridge all the way to the gate to Snowbird. Then I took my time cruising down the entire hill to some condo and took a long somewhat uphill traverse to get back to the lift. This run was amazingly soft and powdery, something I have never had for that long of a run. Usually it’s a short section followed by thick trees or empties out onto a trail with tracks. The rest of the day was also amazing but that run truly defined what powder skiing is to me and why I love it so much. This trip has started out great. The first four days in Vegas, Zion, and Arches with my girlfriend were wonderful. And then three days of epic powder skiing have been the best I could have asked for. All through this my Subaru has been dependable and shown no faults or issues (at least no concerning/new ones). It has reminded me that all road trips should be done in fun cars. While more gas mileage could be nice, it is a small price to pay for the fun this car is. It is truly beasting any snow that is thrown at it and it is plenty comfortable and practical enough. I have been getting the car absolutely filthy but thankfully a quick wash at the self wash down the street has gotten the salt clumps off the car and made it somewhat presentable. I will need to do a more thorough cleaning when I get home next month though, that salt is always worrisome. It still is just the right amount of power for a street car in my opinion. It never feels slow but that antiquated giant turbo and all of the AWD losses, certainly means it is not particularly fast by modern car standards. But man is it fun to use the go pedal and rip it around turns!